In the category of young male vocalists like Michael Bublé and Peter Cincottiand probably the role model for both, Harry Connick, Jr.comes a new entry with his debut album. 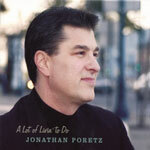 San Francisco-based vocalist Jonathan Poretz has also been linked more seriously in the press to Frank Sinatra, Mel Torme, Tony Bennett and Bobby Darin. These are some serious comparisons, and Poretz does have experience "being" Sinatra in a travelling tribute show to the Rat Pack. He has none of the bel canto style of Tony Bennett, and I think that a more appropriate narrowing of the classification would be somewhere between Sinatra and Bobby Darin. On A Lot of Livin' To Do, Poretz does a nice job. He is a pop singer with a jazz group, which elevates the vibe of this album. I use the words pop singer in the mid-century definition, rather than today's example of pop singer (eg. Justin Timberlake). Like Michael Bublé, Poretz seems very comfortable with the Great American Songbook, and likely with an audience. While Bublé appears to prefer working with a big band, Poretz has expierience with both small combos and large ensembles. On this album, Noel Jewkes, on various reed instruments, adds a lot of coloration to the session. Likewise, pianist Lee Bloom furthers the cause, as does ex-Cal Tjader drummer Vince Lateano, who also plays percolating percussion on the title track. In terms of the selected material, there are plenty of overexposed, crowd-pleasing songs, like Arlen/Mercer's "Come Rain or Come Shine," Jobim's "How Insensitive" and Cole Porter's "Just One of Those Things," but Poretz's lively readings keep the listener tuned in. On more under-recorded tunes like the ballads "Then I'll Be Tired of You" (by Schwartz/Harburg), "I See Your Face Before Me" (Schwartz/Dietz), and the swinging "This Time The Dream's On Me" (Arlen/Mercer), Poretz does an effective job with shading and nuance that would do Sinatra and Tormé proud. On a Frank Loesser medley from Guys and Dolls, Poretz matches up the rarely heard "My Time of Day" with an unusally up-tempo take on "I've Never Been In Love Before." Track Listing: A Lot Of Livin' To Do; My Time of Day/I've Never Been In Love Before; Then I'll Be Tired Of You; Come Rain Or Come Shine; How Insensative: I'll Remember April; It Never Entered My Mind; This Time The Dream's On Me; On The Street Where You Live; I See Your Face Before Me; Just One Of Those Things. Personnel: Jonathan Poretz: vocals; Lee Bloom: piano; Noel Jewkes: tenor sax, clarinet, flute, valve trombone; Pierre Josephs or Jeff Neighbor: bass; Harold Jones: drums; Vince Lateano: drums, percussion (1).